Is enough being done to monitor the steam pipe system in Boston and Cambridge? Ally Donnelly investigates. Correction: The video above and an earlier text version of this story said that Paul Hammel was injured in an accident in 2007. The accident actually occurred in 1997. Paul Hammell can still hear the roar of the steam rushing toward him. Back in 1997, an apprentice at age 28, Hammell was working on a steam pipe system renovation project at the University of Massachusetts’ main campus in Amherst. He was in a manhole when two blasts of steam from a pipe rupture covered his body in third-degree burns. A jury found the school and the engineering firm negligent and awarded Hammell nearly $393,000. The judge reduced the amount to $100,000, in compliance with the damages cap by the Massachusetts Tort Claims Act. Boston and Cambridge have a large steam system as well. It is separate from the system in Amherst, run by Veolia North America. The more than 25 miles of steam pipes provide heat and hot water for high rises, hospitals and biotech firms in the two neighboring cities. But the NBC10 Boston Investigators found that the state almost never investigates steam pipe leaks, ruptures or other incidents. Veolia is currently tangled in a lawsuit with a telecom company that accuses Veolia of failing to maintain its infrastructure. It's a claim Veolia denies. All that leads some city leaders to worry that pressure could be building underneath our streets. 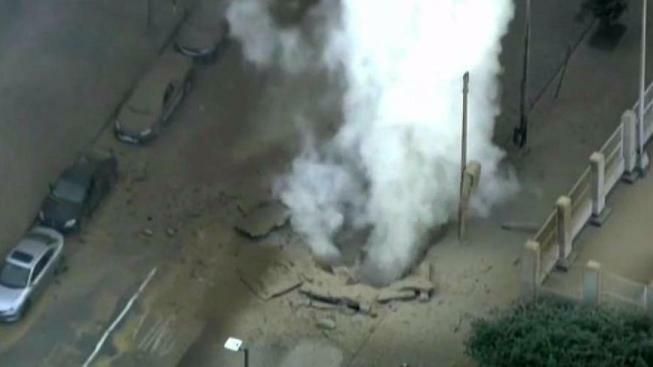 From New York to California, steam pipe failures have killed at least 14 people and injured dozens more. “They’re largely invisible and something people take for granted until there is a disaster,” said Joseph Kane, a senior research associate with the Brookings Institution’s Metropolitan Policy Program. But steam is a strong clean energy option, and some advocates say the state should look at options to expand the system. Galen Nelson, the senior director of innovation and industry support with the Massachusetts Clean Energy Center, lists cost savings, resilience, greenhouse gas reductions as some of the benefits of a steam heat infrastructure system. But others wonder if there is enough oversight on the system we already have. It’s difficult to get a true sense of what’s happening beneath the streets. The state has only been regulating steam since 2013, after a series of incidents pushed then Boston Mayor Thomas Menino to demand more oversight. Between 2013 and 2016, Veolia has reported 485 leaks, ruptures and other incidents which caused $3.3 million in damage to city and private property, according to state documents. Repairs and failures include old and failing expansion joints, broken pipes shutting down businesses, residents without heat or hot water, and some levels of asbestos released into the air. “We are indirectly paying for these leaks every time an ambulance is called or a fire truck, road work, or the fact that we may need to have flagmen or police detail to redirect traffic, we are paying for this,” O’Malley said. The NBC10 Boston Investigators requested an interview to ask Veolia exactly how they maintain the system and prevent failures, but they declined. In their statement they said that Veolia is committed to safety and reliability in the delivery of so-called "green steam." A spokesperson from the Department of Public Utilities also declined an interview. A subsequent records request for DPU for all of their investigation reports yielded just one. “It troubles me greatly,” O’Malley said. Level 3 Communications in 2016 sued Veolia, accusing it of failing to maintain the system in such a manner that leaks are causing overheated manholes. The lawsuit centers on a particular manhole in Chinatown. Level 3 claimed Veolia failed to fix a steam leak near a manhole they share, making it so hot they had to ban employees from doing work in it. Veolia said water from “other networks’ leaks or heavy rain” touches the steam system and creates vapor. “This secondary vapor originates from these outside influences, and is not the result of a steam leak. Veolia Energy North America is vigorously defending against the property damage claims brought by Level 3 and denies responsibility for the claims,” Veolia said in its statement. The Cambridge City Council called for a system-wide review late last year, and O’Malley said he is considering doing the same.